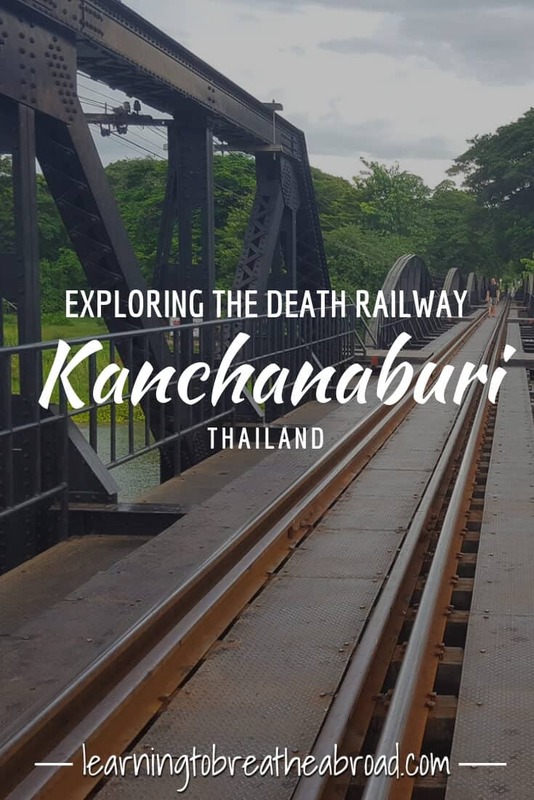 Kanchanaburi has a sad and deeply moving history dating back to World War ll when nearly 90 000 people died building what has become known as the Death Railway. These included 16,000 Australian, British and American Prisoners of War. 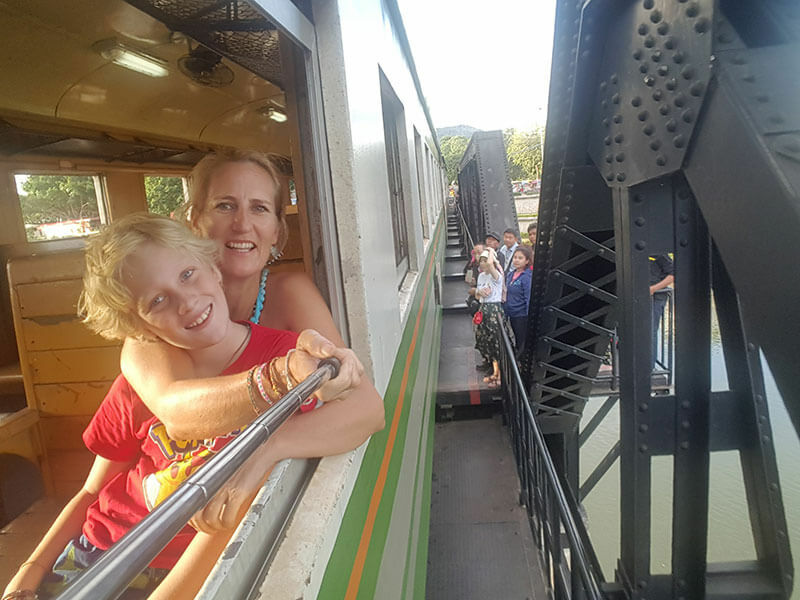 When it comes to being homeschooled and learning from the world around us, Kanchanaburi’s history will forever live in Tai’s heart. 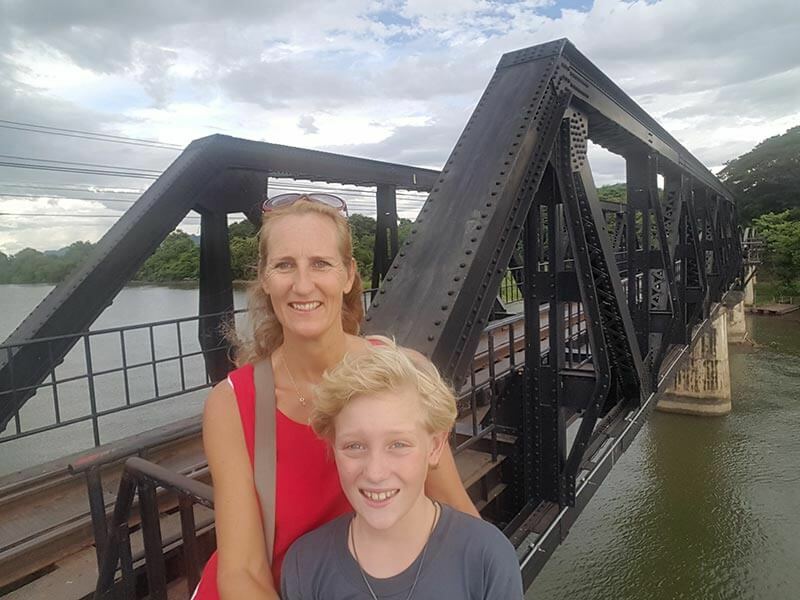 I was dreading dragging Tai around the museums and the Death Railway related historic places – who ever enjoyed a museum at the age of 10? Well, I am happy to tell you, I was rather pleasantly surprised! 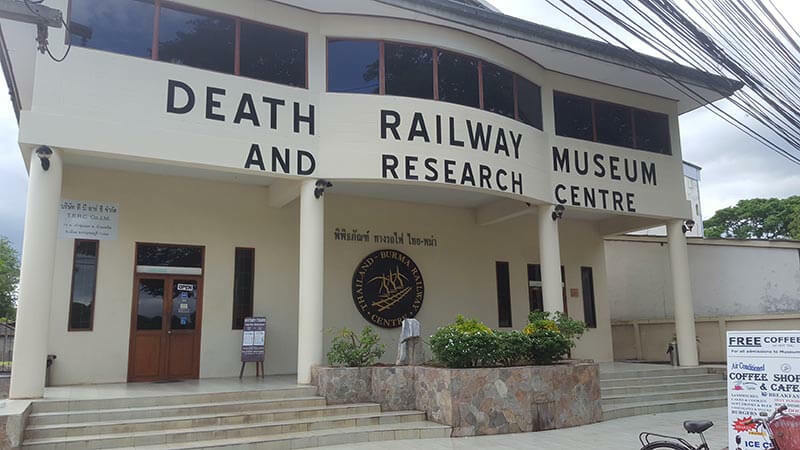 We started at the Death Railway Museum – where we got a free cuppa coffee with our entrance ticket – which was already a winner in Tai’s books as he loves anything free! The museum was full of information but presented in such clever and original ways. There were interactive displays, videos, actual artifacts, life-size re-enacted scenes and a real train carriage for easier imagining of what it was like. Tai really enjoyed it, running from one scene to the next, while I got extremely emotional and even had a big cry! Then out into the sunshine and across the road, we went to the cemetery. 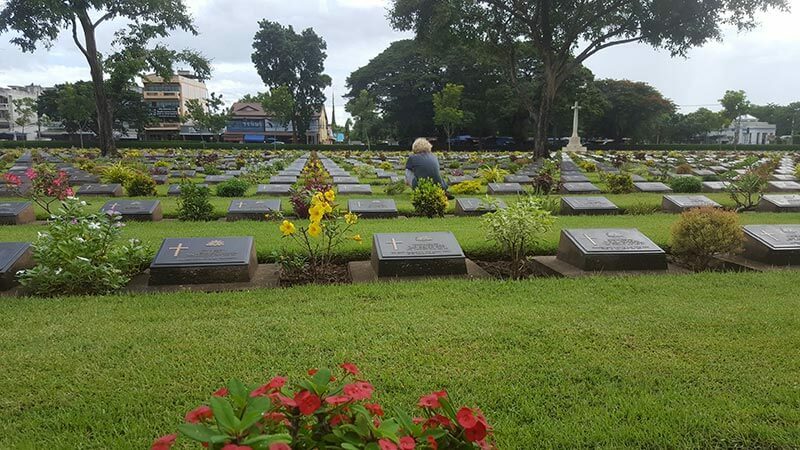 Nearly 7000 Australian, British and American POW’s are honoured here. We spent quite a while wandering through the gravestones, reading the messages from family and noting the young ages of those resting here. Tai particularly liked that little fluffy koala bear toys that had been placed alongside many of the Australian’s gravestones. 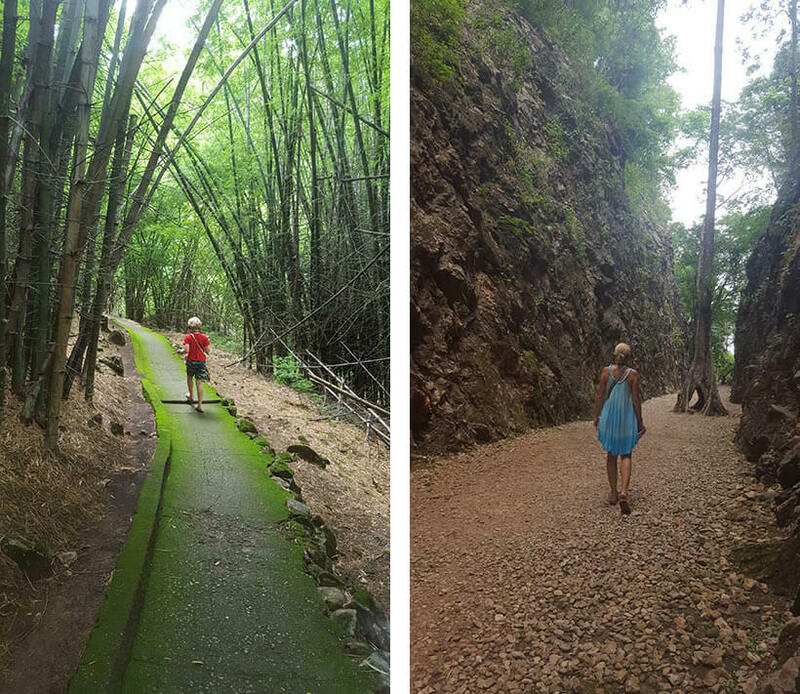 We then took a long stroll – it’s about 5km, but we like walking – from the cemetery to the Bridge over the River Kwai. The train only passes over twice a day and even when it does it goes at a snail’s pace, which means that you can walk right across the bridge and linger on the tracks for good photo opportunities. The next day we got up early and took the local bus to HellFire Pass. Only 40 baht and if you let the driver’s assistant know where you want to get off and they’ll make sure you do! 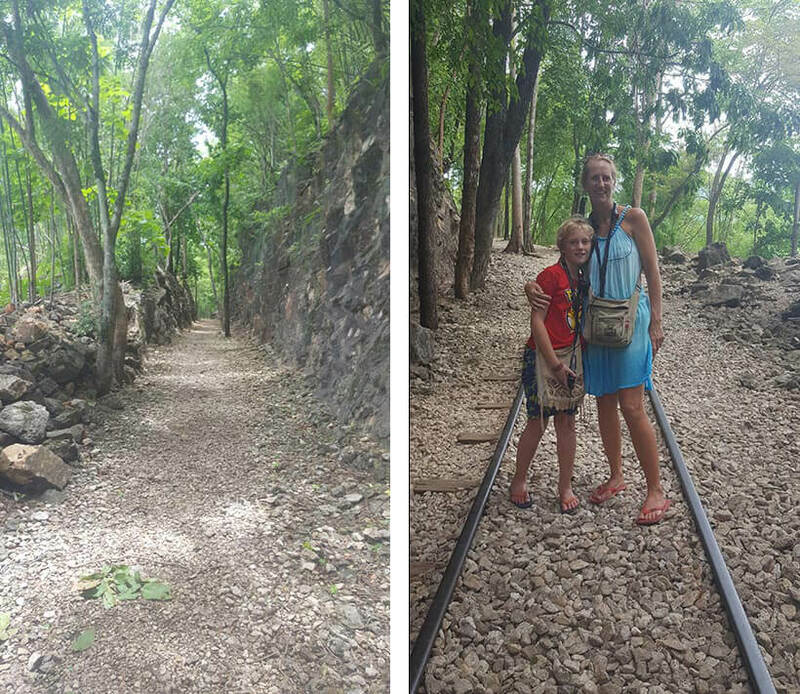 Hellfire Pass is a cutting on the Thai-Burma railway, that was known for its extreme conditions, remoteness and working round the clock to complete the railway on an unrealistic time schedule. The Hellfire Pass Memorial Museum is well laid out and offers an audio guide for use on the 4km long Walking Trail. There are numbered markers all along the walk with corresponding audio for each spot. The audio was fascinating with a narrator setting the scene and surviving POW’s telling anecdotes about their time at Hellfire Pass. Tai was completely engrossed for the entire 3 hour duration of our walk – and that’s no mean feat! It’s hard to even try an imagine how anyone could survive these conditions – monsoon rains, tropical diseases, rotten or no food, mosquitos, only dynamite, hand drills, picks and shovels with which to forge a track through solid rock. The amount of heartache, pain and suffering that was experienced along these tracks is immeasurable and was to me quite unfathomable. From the museum, we were supposed to wait for the local bus heading back to Kanchanaburi. 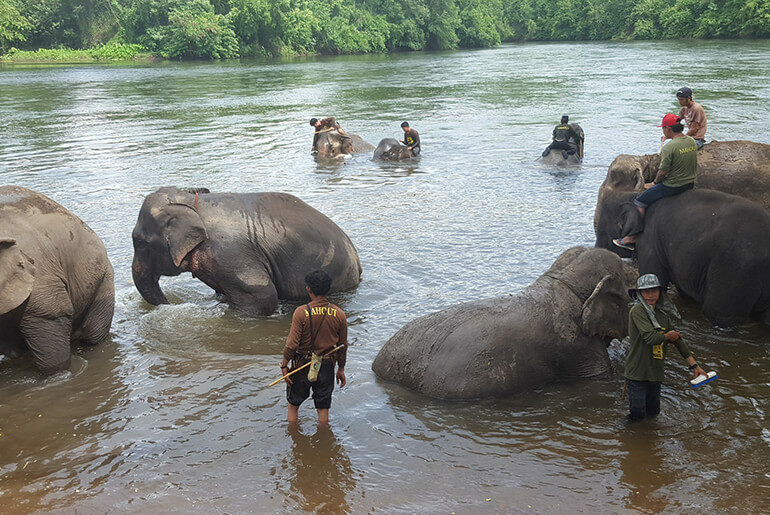 It comes past every 30 minutes, but we were feeling impatient, so stuck our thumbs out and hitched a ride in the back on a Fortuner truck belonging to a lovely Thai family. 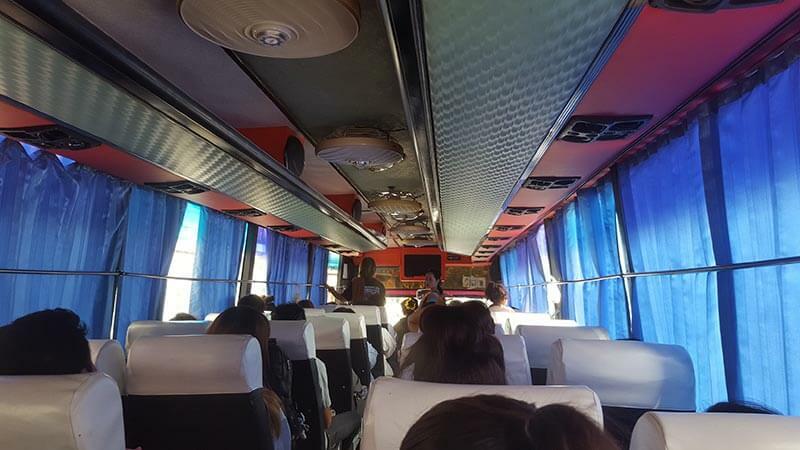 Next stop, the Sai Yok Waterfall. Sadly, not very impressive, maybe due to the lack of water, but pretty wooden bridges and walkways and lots of restaurants all around. We had a quick bite to eat – Pad Thai for Tai of course! 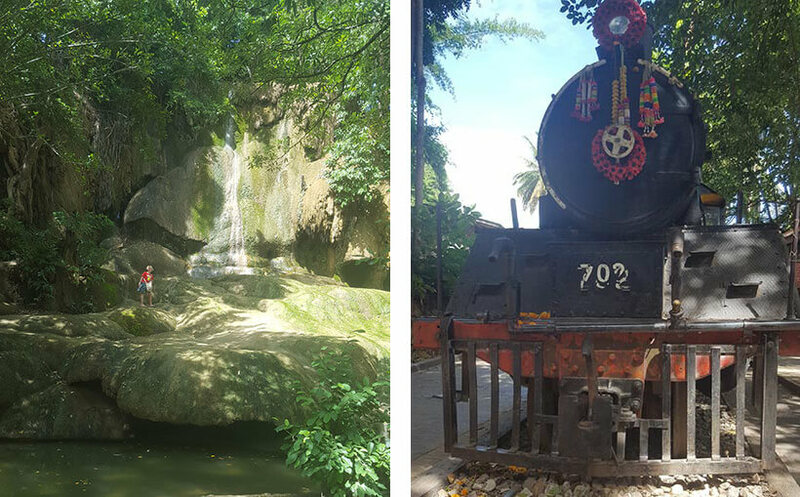 Right next to the waterfall, the Nam Tok Sai Yok Noi station is the last stretch of the railway line that used to make up the Death Railway. Here you will find one of the original train engines marking the end of the tracks. 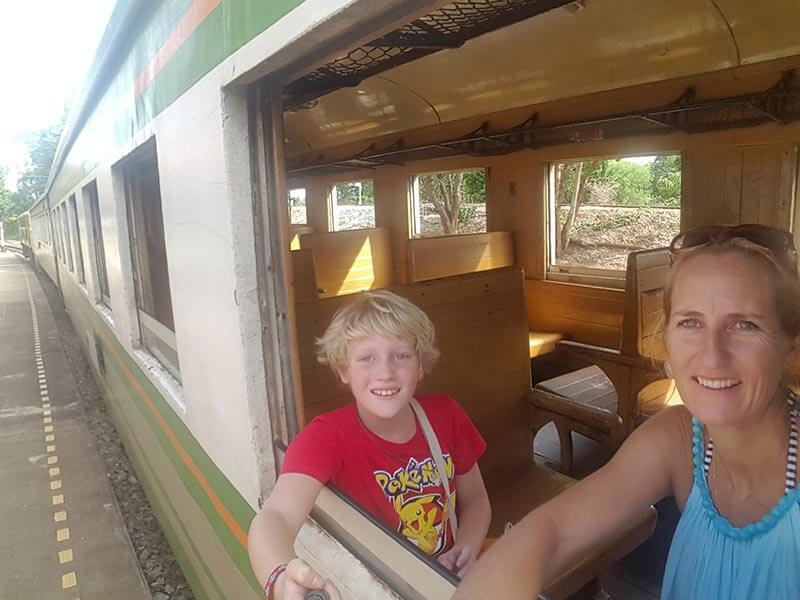 Unfortunately, this station is no longer active so off we headed down the tracks to the Nam Tok Station for the highlight of our day – a train trip along the Death Railway, back to Kanchanaburi. The train tickets are 100baht no matter where you get on and you can even go the entire way to Bangkok. 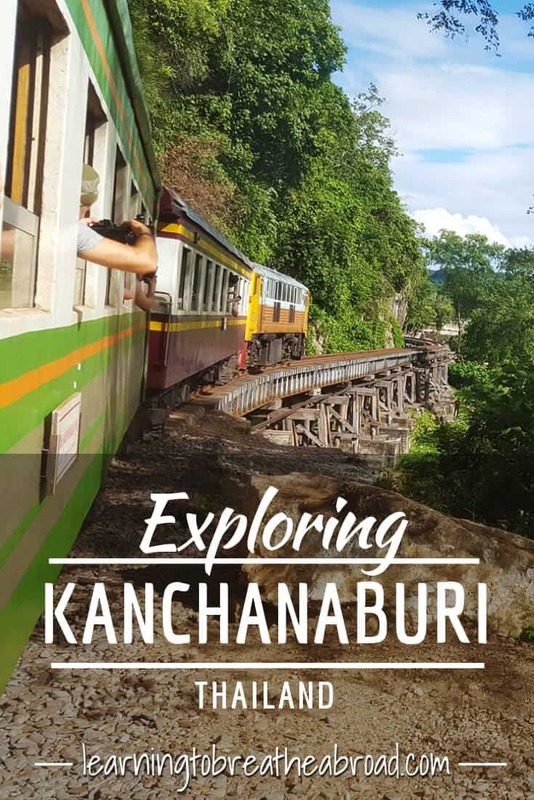 If time is on your side, then instead of a minivan / bus from Bangkok to Kanchanaburi, the train is a lovely alternative option. 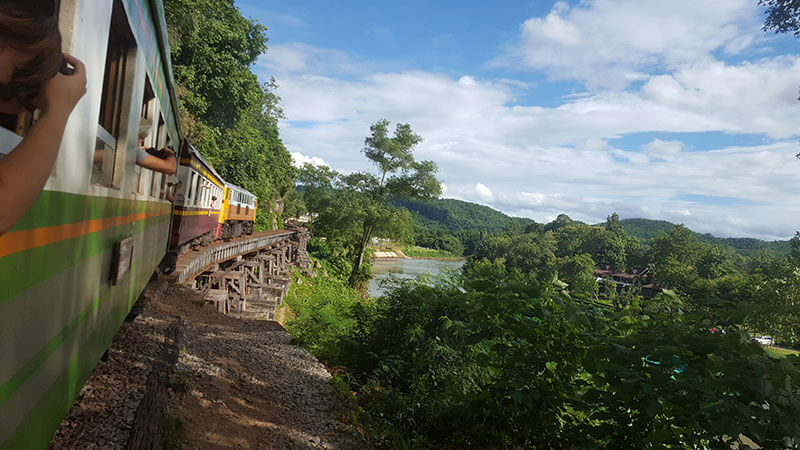 The train clickety-clacked through scenic farmland, trailed alongside the River Kwai and went along some death-defying tracks with sheer cliffs to the left and a drop into nothingness on the right. 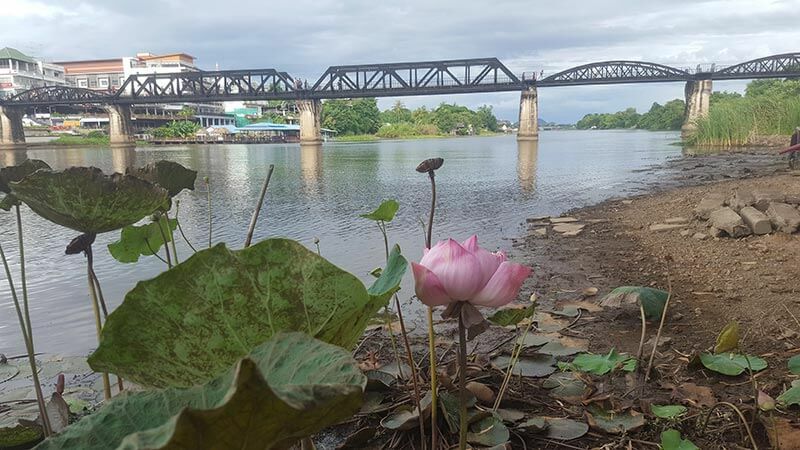 After 3 hours of just watching the world go by, we arrived at the Bridge over the River Kwai. The bridge was full of tourists that all quickly huddled into the bays on each side, to allow for the train to pass. 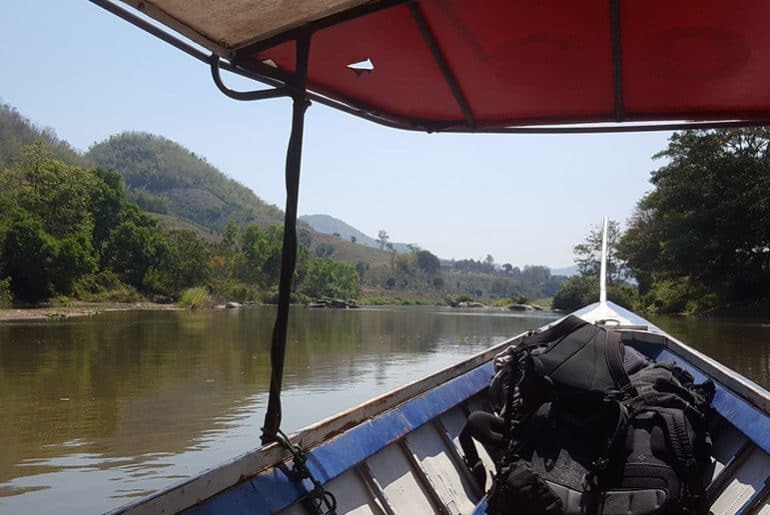 And with that we were back in Kanchanaburi, our history lesson complete, our hearts heavy with sadness but buoyed by the incredibleness of the human spirit to endure and survive. 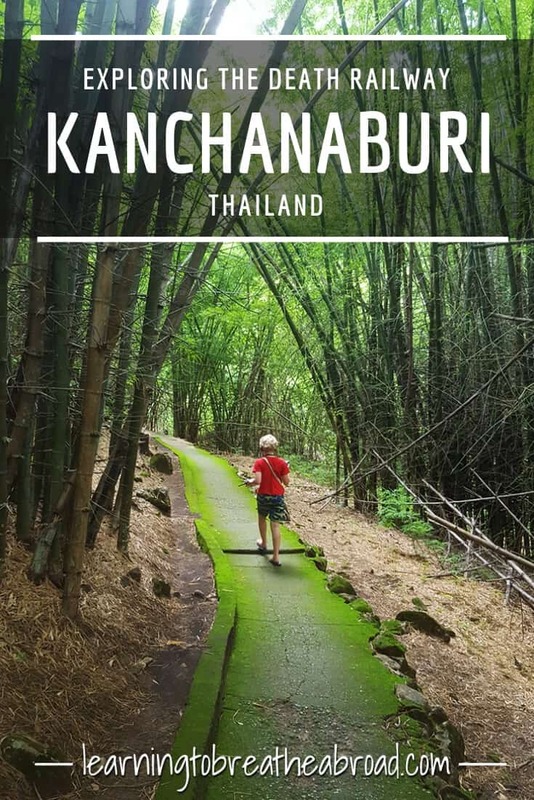 Let Us Know: Have you been to Kanchanaburi, Thailand? What were your impressions of the Death Railway? Tell us in the comments! Mexico is still on my bucket list, so I’ll give you a shout for some pointers when I go. Where did you do your divemasters? Koh Tao? 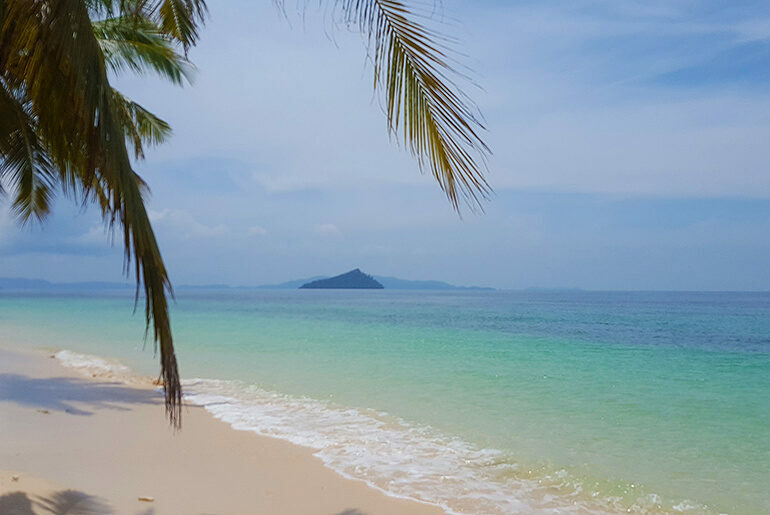 We just spent a month on Koh Tao – blog post still coming 🙂 Enjoy the rest of your travels! You guessed it 🙂 That’s where everyone goes in SE Asia for dive certs I suppose. I hope you liked it, Koh Tao was a magical time for me. Warm water, love and magic, bueno suerte! Koh Tao is definitely my favourite island in Thailand. There is a very special vibe there, funky restaurants and bars and incredible diving and snorkeling! You can’t not love it!